An IR is the behaviour of a system (in this case a guitar speaker miked up in a room) when subjected to a brief input signal, captured in a digital format. It is, if you like, a digital “fingerprint” of the tone of a speaker. It captures every resonance and reflection in a way that a basic EQ cannot. More than that, with a Celestion IR you get the bottled essence of the speaker, a state of the art recording studio, equipment, time and expertise all distilled into an Impulse Response file. A file that gives you great tone, quickly and easily, time and time again. How do I use these/What do I do with them? Impulse Responses are combined (convolved) with the sound of your amp to give you the tone that you want. This can be done in a variety of ways, in a Digital Audio Workstation (DAW), modelling hardware, or even a simple pedal. Watch an introduction to Impulse Responses by Pete Thorn. What equipment will they work with? Do you support all hardware? Our IR downloads are generic in nature, so should work with the hardware you are using. Some pieces of hardware may need you to convert them into other proprietary formats before loading and use, or they may convert them as you load them. Check your hardware’s instructions for details to see if you can use WAV files directly or if they will need any conversion first. Please note though that we cannot provide support for your hardware and its file conversion and loading process. How do I know which IR type to download for my hardware? Which sample rate and length should I use? We provide digital downloads in the sample rates 44.1 kHz, 48.0 kHz, 88.2 kHz and 96.0 kHz and in lengths of 200 and 500 ms. When you go through the purchase process you will see a list of hardware manufacturers. 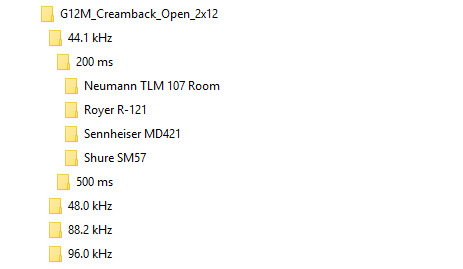 If you are using one of these you can choose from this list and your download will only contain the correct sample rate and/or file length for that hardware. If your hardware is not listed you will need to check the instruction manual for the sample rate required. You also have the option to choose to download specific sample rates or an entire package of all sample rates and lengths. All our Impulse Response Digital Downloads are in a generic, non-proprietary, native uncompressed WAVE audio (.WAV) format. Some hardware may need the files to be converted to a specific format before they can be loaded, while others may carry out the conversion for you when you load them. You’ll need to check the instructions for your particular hardware. If your order contains multiple .WAV files, they will be delivered to you as a single ZIP file (see next question). What’s a ZIP file and what’s in it? A ZIP (.ZIP) file is a file that typically contains multiple files and/or folders, losslessly compressed to facilitate easy download. A double click on the downloaded ZIP file will begin the unpacking process and give you various options of how you want it unpacked and where you want the contents to go. The picture above shows how a fully expanded set of files will look. How do I download/buy one? You can find instructions here. Alternatively you can add products to your basket from the individual product pages, and proceed to checkout. Once payment has been made, you can download the product files from the ‘My Downloads’ area found within your account area. What is a Plugin/Loader? Do I need one? A plugin is piece of software that DAW’s use to load Impulse Responses. A quick search of the web will find you both free and paid for Plugins. You will need a Plugin for the vast majority of Digital Audio Workstations. Yes. Download our brilliant free demo mix here. We accept Visa, MasterCard, Maestro, American Express, and PayPal (which also accepts Discover and Maestro cards). How large are the ZIP files/How long will it take to download? Downloading files should not take long, but will vary depending on your internet connection, download speed, and how many files are being downloaded. Each single cabinet product file is approximately 15MB, which based on a slow broadband connection (2Mbit/s) would take around 2-3 seconds to download. So, with a slow connection, a full package would take approximately 10-12 seconds in total. I started downloading one and there was a problem half way through, what do I do? You can log back in to your account and restart the download from within ‘My Downloads’. How can I see what I have already purchased and download my files again? You can login to your account and check this from the ‘My Downloads’ area. Is there a time limit or limit on the number of times I can download my purchases? There is no time limit and you can download your files up to 5 times. Do you offer a frequent buyer points or discount system? No. Maybe one day though. Why are there only a small selection of your guitar speakers for sale as digital downloads? We decided to start with a cross section of some of our most popular models, keep an eye out for more soon! Can I share, give or sell my files to someone else? No. Please see our End User Licence Agreements for details on sharing the files, simultaneous use of the same download and more. Please note downloads are tagged with unique Identifiers so we can track them back to the original purchase. Please login to your account and select ‘Account Details’ from the Dashboard. I can’t remember my password – How do I get a new one? You can request a new password from the login screen. You will then be able to reset this using your email address. I can’t seem to log in to my account – What should I do? Start by double-checking you have entered the correct information. If this does not work, you can reset your password from the login screen. If this does not work, contact us here. If you can’t find the answer you need in the FAQs, click here to contact/email us. It still sounds like a swarm of bees or buzzy – what should I do? High gain guitar amps sound very bright without a speaker or impulse response to filter a lot of the high frequencies. If you don’t have the IR enabled properly, or it’s in the wrong place in the signal chain, it’s easy to get a bad sound fast. Firstly check your convolution plugin is switched on and your IR of choice is selected. Secondly, make sure 100% of your guitar sound is going through the IR. Sometimes the plugin will have a mix dial, set this to 100%. If you’re using a reverb convolution plugin, set it to 100% wet. Lastly, the IR must be in the right place in the signal chain; make sure it’s after your amp. If you’ve ever rolled your tone control back with a high gain sound and wondered why it doesn’t get any darker – that’s exactly what you’re doing having the IR before the amp simulation. After these quick few checks you should be good to go!